Happiest of Tuesdays to all of you! I’ve cleaned house literally and metaphorically and I’m ready to start anew! I’ve had a good long time to sit back and take a long look at those around me and I’ve come to a better understanding about who I am and who I want in my life. Needless to say, I feel pretty good. Which is why I’m posting an image that is literally my interpretation of “a breath of fresh air”. It’s important in life to sweep away the bad and bring in the good and for whatever reason, Autumn is my spring-cleaning time. So, let’s call it the Autumn Awakening. Where we wake up all the good in our world! Take the bad bits and allow them to float as dust in the wind. Gone. What better way to start the Autumn Awakening then in a gorgeous gown by the oh-so-fabulous White Armory! 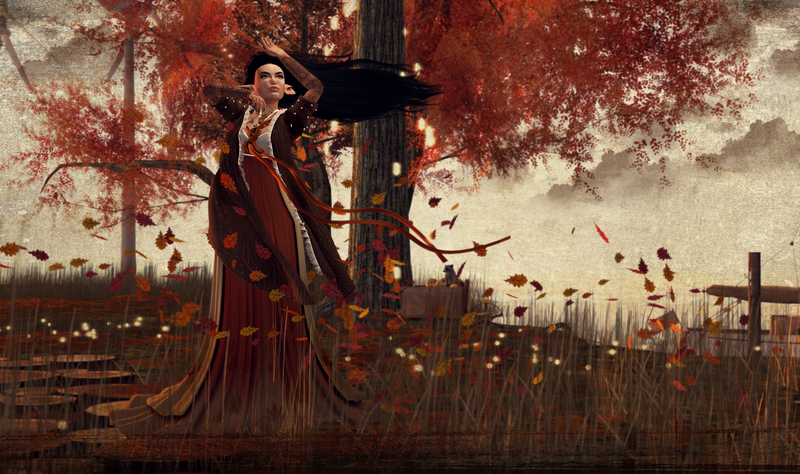 My sweetie Bee has created a stunning autumnal inspired gown called, “Invoking Autumn” for We ❤ RP and it’s gentleness and delicate bodice are simply breathtaking. I’ve paired it with this adorable coat by MoonAmore for Shiny Shabby. Last but not least… Have you seen this tattoo from White Widow?! Um… Can we say freaking amazing?! It too is available at Shiny Shabby. It’s called, “Dream Catcher” and is available in a variety of popular appliers. Happy shopping, fantanistas! LASHES: Lash Set by .ARISE.